Edmond Chan, Artsci’97, is not your typical crime fighter. The member of the Hong Kong branch executive committee of the Queen's University Alumni Association doesn’t chase criminals in the street and he wears a suit instead of a superhero cape. For the past five years, Mr. Chan has worked in the Financial Crime Compliance Department at the Hongkong and Shanghai Banking Corporation (HSBC). He is responsible for ensuring processes and policies are in place to identify suspicious transactions (for crimes such as money laundering) and protect the bank and its customers from the threat of financial crime. “We look to make sure we have the right systems and processes in place to detect and deter these problems. So I am two layers down – I am not directly facing these customers who might be criminals but I might be able to detect them,” says Mr. Chan. When not trying to track down suspicious bank activities, Mr. Chan is a busy Queen’s volunteer. 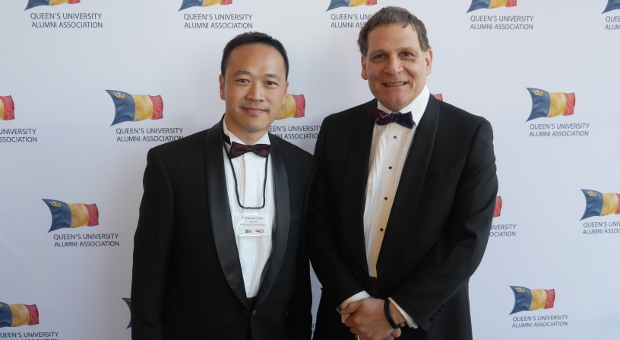 He travelled across the globe on the April 8 weekend to attend the Alumni Volunteer Summit and Queen’s University Alumni Association Awards Gala in Kingston to connect, learn and celebrate alongside other Queen’s alumni. He is also busy helping the Hong Kong Branch prepare for a major event – Queen’s 175th anniversary celebrations in Hong Kong. Principal Daniel Woolf, Artsci’80, Chancellor Jim Leech, MBA’73, and Professor Emeritus Dr. Arthur McDonald (the co-recipient of the 2015 Nobel Prize in Physics) will travel to Hong Kong to celebrate the university’s historic milestone. While back on Queen’s campus, Mr. Chan took time out of his busy schedule to talk about his career, the upcoming celebrations in Hong Kong and why he volunteers for one of the Queen’s most active international alumni branches. Question: Tell us about your job at HSBC. Answer: For the last five years, I have been in the Financial Crime Compliance Department. I am trying to prevent financial crime. It’s an exciting field. I don’t work directly with the police but I do keep myself updated on the latest financial criminal activities in order to prevent them. Question: Why did you want to get into this field? Answer: Five years ago when I was looking to change fields within the bank, this opportunity came up. A manager came to me to ask me if I wanted to start up a department to look at how the bank can improve its controls in financial crimes compliance. Question: Does this job make you a crime fighter? Answer: In a sense I am. We try to stop them at action points and prevent the money from moving around. That’s how you deter these customers. We look to make sure we have the right systems and processes in place to detect these problems. Question: Why do you volunteer for Queen’s? Answer: My love for the school really. The few years I spent at Queen's were the most important in my life. That's when and where I learned to become a better person. I want to give back to the school and being a volunteer is one of the best ways. Question: On May 20th, Hong Kong will host Queen’s 175th Celebrations. The events include retired Judge of the High Court Kin Kee Pang, Arts’70 receiving an honorary degree, and a black-tie dinner featuring Queen’s Professor Emeritus and Nobel Laureate Dr. Arthur McDonald, Principal Daniel Woolf and Chancellor Jim Leech. How does it feel to have the tricolour spirit come to Hong Kong? Answer: It is always great when there are school officials in town as it affirms the school's commitment and support to our branch and its volunteers. Having the event held in Hong Kong is even better because it shows the importance of our city and our branch to the school. Question: Why do you think Hong Kong is one of the most spirited international Queen’s alumni branches? Answer: I think it can be linked to our lifestyle. It is common in Hong Kong for friends to hang out after work and that creates opportunities for the alumni community to meet up. These gatherings are casual and often held at convenient locations making them very accessible. Many who have attended found these events engaging and interesting as they could connect with alumni from different years and learn from each other. Question: You recently came back to Queen’s campus in Kingston to attend the Alumni Volunteer Summit. Why did you want to come? Answer: Being a Branch volunteer in Hong Kong, I have always wanted to learn from other Branch representatives from around the world to see how we can serve our fellow alumni and the school better. The AVS provides a perfect opportunity for that. Besides, I have always wanted to come back to Queen's and the summit created the perfect excuse. Question: What was the most important lesson you learned as a Queen’s student? Answer: The most important lesson did not come from any specific class or classes but in general, Queen's had equipped me with the ability to learn. This is very important in today's world which is very diversified and ever-changing.